Watch George Harrison and Eric Clapton Play The Beatles' "Taxman". Beatles Radio: The Beatles, Solos, Covers, Birthdays, News The Fab 4 and More! 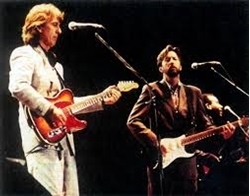 Watch George Harrison and Eric Clapton Play The Beatles' "Taxman"
As we've pointed out (over and over and over again), George Harrison and Eric Clapton continued to work together long after those mythic days of "Sour Milk Sea," "While My Guitar Gently Weeps" and "Badge." This is especially true of the early Seventies and the late Eighties, when Clapton appeared on Harrison's Cloud Nine (1987) and Harrison appeared on Clapton's Journeyman (1989). When the pair toured Japan together in 1991, Harrison's set was packed with a crowd-pleasing assortment of Beatles tunes (it was the first time Harrison had performed Beatles songs in Japan since 1966). Among the highlights each night was "Taxman," which originally appeared on the Beatles' Revolver (1966), and which the Beatles never performed live. Above, you can watch Harrison and Clapton tackle the classic Harrison-penned tune. If you like what you hear, track down the double album recorded during this tour, 1992's Live in Japan. It features live versions of other Beatles tunes, including "Piggies," "I Want to Tell You," "Old Brown Shoe," "If I Needed Someone," "Something" and "While My Guitar Gently Weeps."